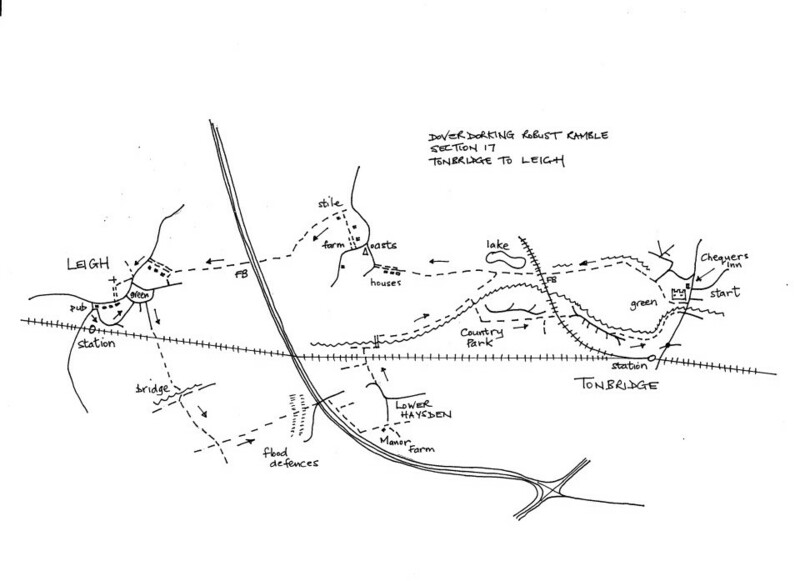 Comment Generally easy walking following sections of the Weald Way and the Eden Valley Way. This is very low-lying land and may be muddy or suffer from flooding in very wet weather. Tonbridge castle is impressive as is Leigh church and surrounding houses. There may be stock in some fields. From the Chequers Inn, walk back, down towards the river bridge. Do not cross but turn right just before to follow a path alongside the river with the castle walls looming high on your right. The path curves to the right, round the castle mound, to a wooden footbridge crossing a stream on the left. Cross this and emerge by a swimming pool and a green with a miniature railway track. Turn right on a roadway upto a T-junction by a car park. Cross to a footpath which goes down by a stream and a line of ancient willow trees. Follow the stream for some way, passing playing fields. Eventually pass under a railway line and over a footbridge bridge. Walk through trees to a junction of footpaths with bridges to left and right. Turn right and cross the bridge towards a lake. Enter an enclosed path now with a tarmac surface. Keep on for some way passing the lake on the right and eventually houses on the left to emerge onto a road. Turn right along the road then soon first right downhill towards oasts at the foot of the hill. Pass the oasts and immediately turn left at a road junction. In 100 metres go right up a path, up the entrance drive to ‘The Hutchings’ (‘The Plough’ pub is a short distance on along the road). At the end of the drive go ahead on a narrow path up the side of a farm building and enter a field. Keep forward up the side of a large field with a hedge on the left. At the top corner, go through a gate and on between buildings to a drive. Cross the drive to a stile. A wooden fence circles the field enclosing a path around the edge. Turn left uphill with a hedge on your left and the fence on the right. Go up and over the hill and down towards a corner. Just before the corner the path drops down a bank on the left and leaves the field. Cross a wooden sleeper bridge, bear slightly left into a field, then on up a pasture to a metal footbridge. Pass through trees and on across an open field. At the end of the field, go ahead on a narrow footpath into woods. Keep on in the same direction to a long footbridge crossing a major road (A21). At the far side keep on across several stiles and fields always with a hedge on your left. Eventually housing begins on the left. Keep on along the field edge to a final stile. Over this the path becomes enclosed at the foot of house gardens. Soon it emerges onto a gravel drive. Ignore path down on the left, go straight ahead up the drive to reach a busy road. Turn left with care for a short distance then turn right off the road up the main entrance to Leigh church. Pass a fine Gothick gateway and enter the churchyard. Walk through, passing the church. Leave the churchyard at the gate at the far side and go on down an entrance drive. Soon reach the main road through the village with the green opposite. Turn right on the road and walk along past the ‘Bat & Ball’ pub and the village shop, to reach the ‘Fleur-de-lis’ pub on a corner and the end of the section.